When I was first diagnosed I consulted with a variety of specialists, I felt that I still didn’t get a good understanding of what’s really going on in Hashimoto’s. You are not going crazy! The anxiety, depression, irritability, mood swings, and emotional numbness you are feeling could be related to your thyroid. Thyroid antibodies are a marker that lets us know that the immune system is destroying thyroid tissue, which can cause a release of hormones into your bloodstream causing a transient hyperthyroidism and the related mood alterations, followed by an onset of hypothyroidism. Selenium deficiency has been recognized as an environmental trigger for Hashimoto’s, so you may want to consider using a selenium supplement. A dose of 200 mcg of selenomethionine has been shown to reduce thyroid antibodies by about 50% over the course of three months in people with Hashimoto’s. In my experience, this can help people feel calmer and can also improve energy levels and hair regrowth. Going gluten free is a strategy that everyone with Hashimoto’s should try. In some cases, we see a complete remission of the condition; in other cases (88% of the time), the person feels significantly better in terms of bloating, diarrhea, energy, weight, constipation, stomach pain, reflux, hair regrowth, and anxiety. 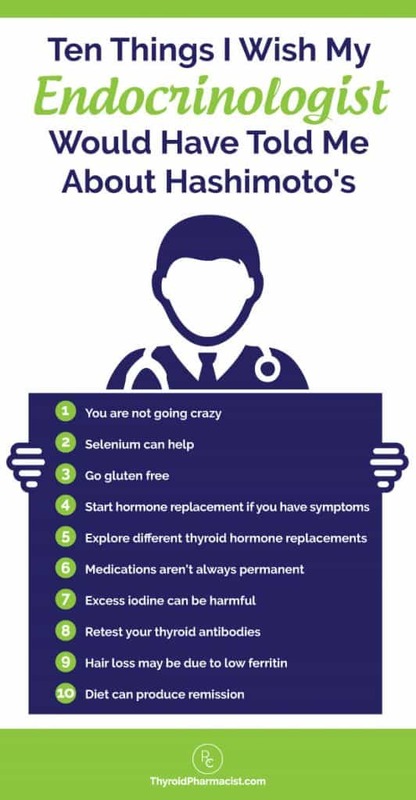 If you are having symptoms of subclinical hypothyroidism—like fatigue, weight gain, sadness/apathy, hair loss, fertility challenges, cold intolerance, brain fog, and joint pain—it may be helpful to start thyroid hormones. Studies have found that starting thyroid hormones can make us feel better and even slow down the progression of the condition! Some people may not convert thyroid hormones properly, and thus taking a T4-only containing medication like Synthroid or levothyroxine may not relieve all of your symptoms. There may be an advantage to taking a combination T4/T3 medication. Read about which thyroid medication is best. Your thyroid may function and work on its own again at some time in the future. There is a test we can do to figure out if you can be weaned off from medications. Innovative new therapies like low level laser therapy may also help people improve the function of their thyroid and wean off meds! Hashimoto’s and iodine deficiency hypothyroidism should be treated differently. Iodine excess may aggravate Hashimoto’s in some cases, leading to anxiety, irritability, brain fog, palpitations, and fatigue, as well as accelerated damage to the thyroid gland. For people with Hashimoto’s, the low doses of iodine that are found in multivitamins and prenatal vitamins (150 mcg–220 mcg) are generally safe. Thyroid antibodies, thyroid peroxidase antibodies (TPO antibodies) and thyroglobulin antibodies (TG antibodies), are a marker of how aggressive the attack is on your thyroid gland and can be used as a marker to track your condition. You should retest your antibodies every 3 months to see if your lifestyle interventions are working. Your hair loss could be caused by low ferritin. Ferritin is a stored form of iron that is often depleted in Hashimoto’s. Your diet could be helpful in eliminating your thyroid symptoms, reducing thyroid antibodies and some people even have been able to eliminate their thyroid antibodies through diet alone!